Zanivan S, Meves A, Behrendt K, Schoof EM, Neilson LJ, Cox J, Tang HR, Kalna G, van Ree JH, van Deursen JM, Trempus CS, Machesky LM, Linding R, Wickström SA, Fässler R, Mann M.
Cancer progresses through distinct stages, and mouse models recapitulating traits of this progression are frequently used to explore genetic, morphological, and pharmacological aspects of tumor development. 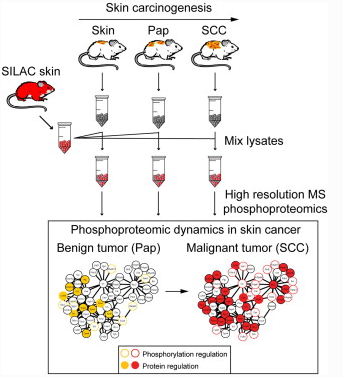 To complement genomic investigations of this process, we here quantify phosphoproteomic changes in skin cancer development using the SILAC mouse technology coupled to high-resolution mass spectrometry. We distill protein expression signatures from our data that distinguish between skin cancer stages. A distinct phosphoproteome of the two stages of cancer progression is identified that correlates with perturbed cell growth and implicates cell adhesion as a major driver of malignancy. Importantly, integrated analysis of phosphoproteomic data and prediction of kinase activity revealed PAK4-PKC/SRC network to be highly deregulated in SCC but not in papilloma. This detailed molecular picture, both at the proteome and phosphoproteome level, will prove useful for the study of mechanisms of tumor progression.